Evaluating a film like,Teenage Mutant Ninja Turtles: Out of the Shadows, requires the use of a rather generous bell curve to result in a passing grade. In every conceivable way excluding its tone – perhaps the one saving grace – Out of the Shadows falls short. This film is a tremendous compilation of failure, something that isn't quite bad enough to be memorable, but still several steps below passably mediocre. This film wishes it were risible; at least it would evoke a positive reaction unrelated to the frustration and annoyance it leaves viewers feeling after just shy of two hours of crap. How can a film like Out of the Shadows fail, considering how low the expectations are in the first place? This is, after all, a sequel to a film based on an almost three-decade-old cartoon rooted in an underground graphic novel series, which has already inspired a separate film franchise, a one-off animated film, and additional television opportunities. Possibly the most notable aspect of this franchise is the legendarily catchy theme song co-written by CBS archangel, Chuck Lorre. 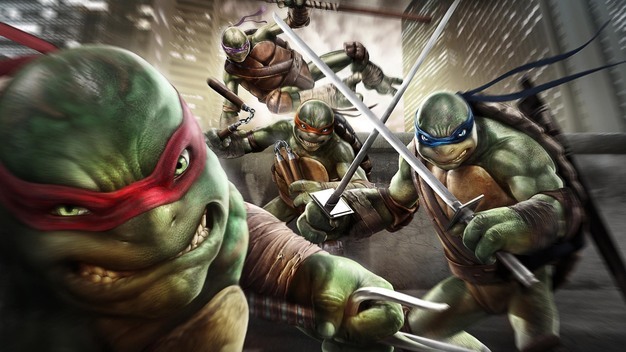 All of this is about four beings that are mutated turtles who are indeed teenage and have ninja training and are also named after Renaissance painters (Leonardo, Donatello, Michelangelo, Raphael). Should there be any expectations of quality for a movie with that kind of a background? Technically yes — there's a great movie about the LEGOs — but realistically going into it the standards were pretty low. All one could really ask for from Out of the Shadows” was for a decent nostalgia trip for those of us who grew up watching the original series and some dumb fun. The premise is terrible enough on the surface to possibly work as dumb fun, and there's potential for a little silliness with the four turtles (voiced by Noel Fisher, Jeremy Howard, Pete Ploszek and Alan Ritchson) fighting an anthropomorphic rhino (Rocksteady, voiced by WWE performer Sheamus) and his warthog buddy (Bebop, voiced by Gary Anthony Williams), alongside a hockey masked vigilante (Stephen Amell as Casey Jones), all of which leads to a battle with a tentacled talking brain Krang (reliable character actor Brad Garrett voices this one). The filmmakers pulled heavily from the television series this time around, even highlighting the return of Rocksteady, Bebop, Krang and Casey Jones in one of the ad spots. While Out of the Shadows doesn't quite embrace the ridiculousness, the filmmakers keep the tone light and avoid the pretentiousness that plagued Batman v. Superman. The aforementioned villains serve that purpose well enough, and the Great Laura Linney, as an incredulous police chief who of course becomes an ally, doesn't coast as much as she could. Also, Will Arnett, who played a cameraman in the first film, pops in for a spell to do Will Arnett things to some mild success. The looser tone indicates the filmmakers' aim for dumb fun, but the film has much higher levels of incompetence and stupidity than enjoyment. The plot, in which the turtles fight to collect pieces of a portal to prevent master villain Shredder (Brian Tee) from unleashing Krang, is rote and uninspired, as is the internal group drama between the four turtles. The pacing is off, creating a rushed flow to a film that’s still nearly two hours. The dialogue in general is dreadful and repetitive filled with bad one liners and pointless "sciencetician" caliber babble. Megan Fox, as turtle fan April O'Neil, remains a less than remarkable screen presence, while Tyler Perry is around to be terrible. And man, do the special effects leave much to be desired for a movie with seven computer generated characters. All of that is ancillary really for Out of the Shadows' main purpose; to appeal to the millennials like me. This is where the film truly fails, as its haggard plotting steals opportunities to give the fans what they really want like more fights between the turtles and Rocksteady and Bebop. The opposing parties have one rather lackluster brawl because the film waits to establish their existence before sending them off to do things not related directly to the turtles. That an additional fight amongst the anthropomorphized creatures is usurped by a meeting by Casey Jones and an uninspired finale with Krang that just sort of ends fits this movie perfectly; it teases the audience with the possibility of ludicrous fun only to pull it away.